Clean power site now "energised"
A few months ago we carried the story of Aura Power’s plans to install a clean battery storage site in Lockleaze on land adjacent to Kellaway Building supplies site. We are now able to report that Aura Power have now 'energised' the site. 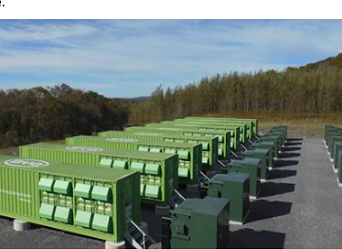 This is the first clean energy storage solution to be granted permission in Bristol on a site that was previously targetted for a dirty fuel diesel generator. This means Bristol now hosts the UK's largest stand alone Battery Storage site in the UK - 15MW. RADE [Residents Against Dirty Energy] was very pleased to hear that the site was in operation and they say, “"RADE [Residents Against Dirty Energy] is celebrating a first for Bristol in general and Lockleaze in particular. Aura Power are now operating the UK's largest battery storage facility in the UK, at 15MW. This is a great way of storing surplus electricity for times when its needed that doesn't require large numbers of diesel generators sited close to peoples homes. RADE worked with Lockleaze to prevent diesel generators on this site, when it was proposed a couple of years ago. We then helped make sure local people were consulted about Aura Power's Battery Storage proposals. Now the facility is working, and we wish the local community and Aura Power all the best for the future."